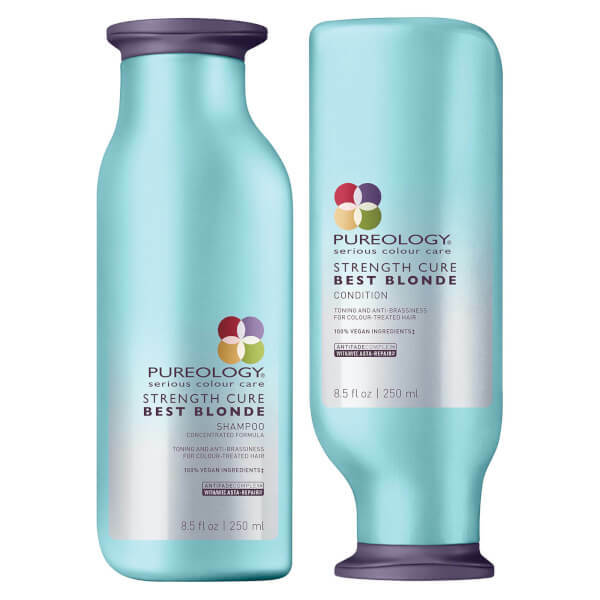 Treat your locks to the Pureology Strength Cure Best Blonde Duo; a shampoo and conditioner that work to nourish and strengthen fragile, over-processed hair, whilst protecting colour vibrancy and promoting bright, luminous locks from root to tip. A colour-correcting, sulphate-free formula infused with deep purple pigments to help eliminate yellow undertones in highlighted or blonde hair. Fortified with the brand's exclusive AntiFadeComplex, the purple shampoo expertly cleanses and tones hair to neutralise unwanted brassy tones in beween salon appointments. 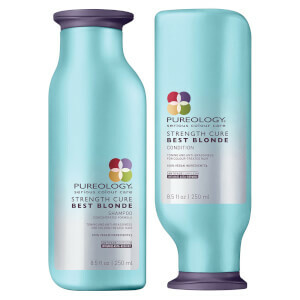 A weightless formula developed for highlighted or colour-treated blonde hair. Fortified with violet pigments and the brand's innovative AntiFadeComplex, the regenerating conditioner helps to eliminate brassiness and yellow tones, whilst strengthening and nourishing damaged hair for salon-worthy results. Blonde hair is refreshed and detangled with glossy shine. Champú: aplicar una pequeña cantidad sobre el pelo mojado. Dejar actuar durante 1-3 minutos (para rubios cálidos), 3-5 minutos (para rubios neutros) y 5-15 minutos (para rubios fríos). Aclarar. Acondicionador: después del champú, masajear el acondicionador sobre el pelo y el cuero cabelludo. Dejar actuar durante 1-3 minutos (para rubios cálidos), 3-5 minutos (para rubios neutros) y 5-15 minutos (para rubios fríos). Aclarar. Shampoo: Aqua / Water, Disodium Laureth Sulfosuccinate, Cocamidopropyl Betaine, Citric Acid, Taurine, Sodium Cocoyl Isethionate, Sodium Hydroxide, Sodium Lauryl Sulfoacetate, Sodium Lauroyl Sarcosinate, Glycol Distearate, Decyl Glucoside, Sodium Chloride, Ppg-5-Ceteth-20, Polyquaternium-10, Parfum / Fragrance, Amodimethicone, Coco-Betaine, Hydrogenated Coconut Acid, Peg-55 Propylene Glycol Oleate, Propylene Glycol, Carbomer, Acrylates/Beheneth-25 Methacrylate Copolymer, Ci 60730 / Ext. Violet 2, Camelina Sativa Seed Oil, Sodium Isethionate, Butylene Glycol, Benzoic Acid, Tocopherol, Olea Europaea Oil / Olive Fruit Oil, Trideceth-6, Glycerin, Helianthus Annuus Seed Extract / Sunflower Seed Extract, Salicylic Acid, Magnesium Nitrate, Hydrolyzed Vegetable Protein Pg-Propyl Silanetriol, Sodium Acetate, Arginine, 2-Oleamido-1,3-Octadecanediol, Cetrimonium Chloride, Poly(Linseed Oil), Benzophenone-4, Sodium Benzoate, Isopropyl Alcohol, Orchis Mascula Extract, Phenoxyethanol, Methylchloroisothiazolinone, Haematococcus Pluvialis Extract, Magnesium Chloride, Methylisothiazolinone, Caprylic/Capric Triglyceride, Potassium Sorbate, Melanin, Pentylene Glycol, Ethylhexylglycerin. Conditioner: Aqua / Water, Cetearyl Alcohol, Taurine, Behentrimonium Chloride, Amodimethicone, Parfum / Fragrance, Isopropyl Alcohol, Phenoxyethanol, Glycerin, Benzoic Acid, Trideceth-6, Tocopherol, Ci 60730 / Ext. Violet 2, Olea Europaea Oil / Olive Fruit Oil, Camelina Sativa Seed Oil, Poly(Linseed Oil), Butylene Glycol, Arginine, Potassium Hydroxide, Benzyl Alcohol, Cetrimonium Chloride, Benzyl Salicylate, Linalool, Helianthus Annuus Seed Extract / Sunflower Seed Extract, Hydrolyzed Vegetable Protein Pg-Propyl Silanetriol, Coumarin, 2-Oleamido-1,3-Octadecanediol, Benzophenone-4, Citronellol, Sodium Chloride, Orchis Mascula Extract, Haematococcus Pluvialis Extract, Caprylic/Capric Triglyceride, Potassium Sorbate, Melanin, Pentylene Glycol, Ethylhexylglycerin.